Cylindrophyllum comptonii is a tough, mat-forming, cushion-like, succulent plant and thrives in nutrient-poor soils. 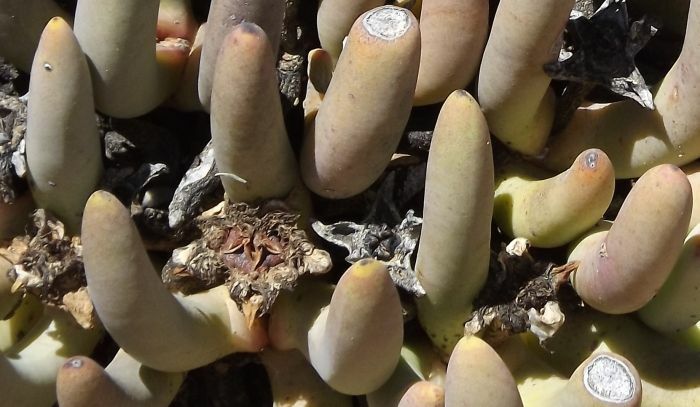 With its finger-like leaves, this succulent will provide a unique texture to any landscape design and is an excellent water-saving species. Cylindrophyllum comptonii is a robust, clump-forming, succulent perennial and has a fibrous root system for quick absorption of water. The cylindrical, grey-green leaves are loosely arranged and up to 100 mm long. C. comptonii can grow up to 250 mm in diameter and has very short stems. The single, white to straw-coloured flowers bloom in spring to early summer (September to November) and can be up to 40 mm in diameter. Flowers usually open at noon and close in the evening. Fruits of C. comptonii are cone-shaped and consist of 5 to 11 locules, which are filled with small dark brown seeds. 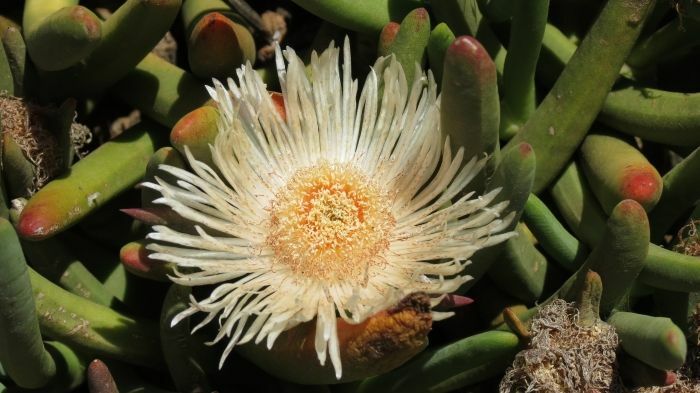 According to the Red List of South African plants website, accessed on 27 February 2019, this species is not threatened and has a conservation status of Least Concern (LC). Cylindrophyllum comptonii is endemic to the Little Karoo, in the Western Cape and occurs in areas from Montagu, Ladismith and the southern parts of Swellendam. Plants grow in rough, north-facing, rocky hills, mainly comprising of shale rocks. It is restricted to the winter-rainfall region and thrives in areas with minimal rainfall and poor soil conditions. Cylindrophyllum is derived from the Greek words, kylistos, which means ‘cylindrical’, and phyllon meaning ‘leaf’, referring to the cylindrical leaves of C. comptonii. This species is named after Prof. Robert Harold Compton (1886–1979), second Director of the National Botanic Gardens of South Africa. This plant belongs to the family Aizoaceae, which is well-known for its leaf succulents. Only 5 species of this genus have been recorded, which are C. calamiforme, C. comptonii, C. hallii, C. obsubulatum and C. tugwelliae. 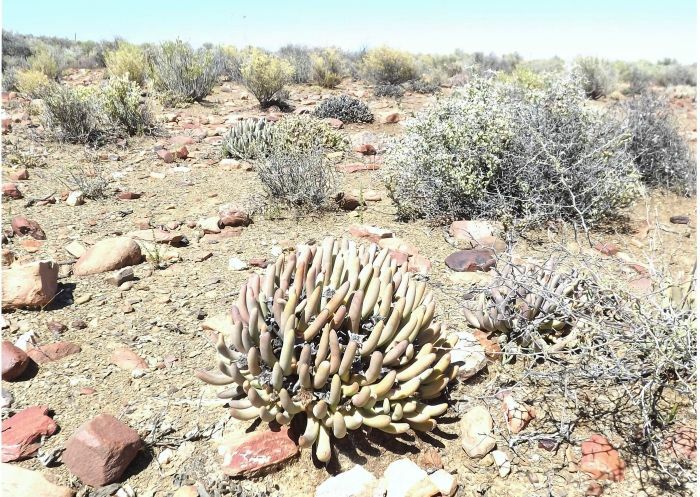 Cylindrophyllum comptonii typically grows in nutrient-poor soil and is adapted to grow in harsh dry conditions. 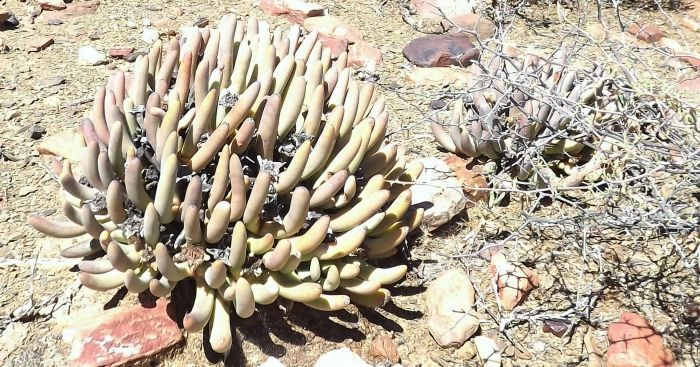 It has the ability to store water in its large succulent leaves and only uses this water in times of drought, especially during the summer months when there is an increase in temperature and outside the rain season. The flower opens at noon and closes late afternoon and is mainly pollinated by bees. Seed capsules only open when it rains and stay closed during dry periods. These capsules are known as hygroscopic. Cylindrophyllum comptonii is not known for any medicinal or cultural uses. This plant is mostly used in the horticultural and landscape industry, as an excellent water-wise plant or in rockeries. Cylindrophyllum comptonii is best used as a water-savings plant. It grows well in dry, hot condition and does not need too many nutrients to grow. This plant can easily be propagated by seed or cuttings. Sow seed during the warmer months of the year. Use a mixture of coarse river sand (60%) and sieved compost (40%). Sow seed evenly onto the mixture and cover with a fine layer of sand. Keep soil medium moist using a mist sprayer. Seeds will germinate within 2 weeks. Seedlings need then to be transplanted into larger containers. Take cuttings during the warmer season (spring and summer). C. comptonii has very short stems. Take cuttings just below the internode and insert in a mixture of 60% coarse river sand and 40% sieved compost. A rooting hormone can also be applied. Water cuttings using a fine mist sprayer. Always use sterilized equipment and soil mediums when propagating plants. Rooted cutting should be transplanted into bigger containers as well. Frandsen, R. 2017. Succulents of southern Africa. Honeyguide Publications, Somerset West. Smith, G.F., Chesselet, P., Van Jaarsveld, E.J., Hartmann, H., Hammer, S., Van Wyk, B-E., Burgoyne, P., Klak, C. & Kurzweil, H. 1998. Mesembs of the world. 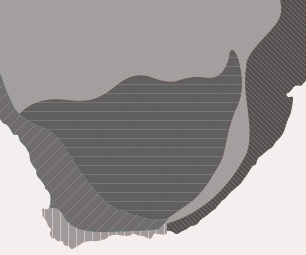 Briza, Pretoria.